The tribe of Moab where descendants of Lot, whose benefactor and savior was his Uncle Abraham, father of the Israelites. In the wilderness, this tribe refused to even sell the Israelites food and water. For that reason, they are banned by the Bible, from joining the Jewish people in marriage. The lack of gratitude on their part, was indicative of an ingrained selfishness and mean spirited character that has no place in Israel. Gratitude goes much further than just telling someone thank you for having done something nice for you. The Torah says, "Do not despise the Egyptian, because, you were a stranger in their land." Now, this is somewhat difficult to comprehend. It was Joseph an Israelite, who saved the Egyptians from starvation during the years of famine. Shortly afterwards, the thank you granted by the Egyptians was to slaughter the Israelites. They threw the babies in the river and enslaved them for hundreds of years. According to the Midrash, Pharaoh had 200 children slaughtered over his bathtub each and every day so that he could bathe in their blood! How can anyone have gratitude for savages of this sort? Granted they initially allowed the Israelites to dwell in their land, but surely the Israelites paid a price for all that, with the hundreds of years of slavery. And yet the Bible commands us to have a sense of gratitude and indebtedness for them. How does one make sense of this directive? The answer is very important, very fundamental. Gratitude, is not only because someone intended and did something nice for you. If you merely benefited, that's the keyword, if you where in any way, shape or form helped, from somebody or even something, you are expected to note that kindness and have a real sense of appreciation for the good done. That is why, for the first plague against the Egyptians, blood, Moses would not hit the Nile River, and turn it into blood. He asked his older brother Aaron to do the “dirty work.” Although water is inanimate and could care less whether Moses lived or died, however, since Moses benefited from the river, it saved his life when his mother placed him in a basket on the river, he felt a sense of indebtedness and gratitude to the river and could not strike it now. The Talmud says, "The well you drank from, do not throw rocks into it". Even though the well has no feelings or thoughts, nevertheless, since you benefited from it, you must not act insensitively towards the water. You must show gratitude and not act ungratefully towards it. A most important gratitude a person must have is towards his parents. They gave you life. You might say, "well, who cares, they didn't do it for me.” “They were obligated to raise me." It doesn't matter. If you benefited from them, you must demonstrate gratitude. Doesn't matter if they did it out of niceness, or they did it because they had to, you benefited - you must have gratitude. And if you don't ….well we already said …. It’s not good at all. 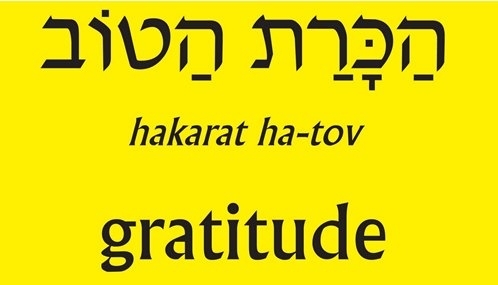 The Midrash says, "Every breath you take, you are obligated to thank G-d." The reason, is that you're benefiting from His air. He created it. You have to thank Him for every breath. And if you don't think it's important, try putting your head in a bucket of water and see how long you can last without air. Every morning the first thing we do after opening our eyes, we place our hands together and “thank G-d for returning our souls to us.” What a wonderful, positive way, to start the day, by acknowledging the blessings and the good we have in life. On this thanksgiving weekend, let us pay more attention to all the good we have been blessed with. This great Country of ours. A beacon of strength and light to the rest of the Universe. A certain father had a family of children, who were forever quarreling. Then he fell ill. Days before he died, he asked one of them to bring him a bundle of sticks. Handing the bundle to each of his sons in turn, he told them to try to break it. Although each one tried his best, none was able to break the bundle. The Father then untied the bundle and gave the sticks to his sons to break one by one. This, they did very easily. "My sons," said the father, "do you see how certain it is, that if you are united with each other, it will be impossible for your enemies to injure you. But if you are divided among yourselves, you will be no stronger than a single stick in that bundle. This is what Shabbat does for a family. It makes every member of the family feel loved, important, indispensable and part of an unbreakable unit. 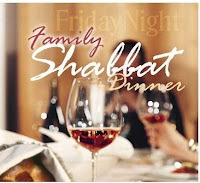 When Shabbat comes, Jewish law dictates, you must live on this day as though all your work has been completed. This is not denial, it is called, LIVING in the now. It means that one day a week, we don’t think about, “making” a living; we actually are, “living”. One day a week we remember that we are more than work. We have a soul. We were sent to earth on a mission. There is something infinitely valuable about our existence, irrelevant of our financial or worldly situation. The Talmud described a fascinating exchange between the Roman Governor in Palestine during the second century CE and the great Jewish sage, Rabbi Akiva. The Romans, like the Greeks, could not appreciate the concept of Sabbath in which you would allow all of your slaves a “day off” of labor. “What makes this day different than any other day?” the Roman Governor Turnusrufus asks Rabbi Akiva. “But perhaps you have confused the days? How are you sure that in all this time you have not misplaced the seventh day”? “The river Sambatyon will prove it!” responded Rabbi Akiva. Rabbi Akiva was referring to a legendary river, named Sambatyon, which means Sabbath in Greek, apparently located in Syria, Afghanistan or Ethiopia. This river was un-navigable on weekdays because it flowed with strong currents carrying along stones with tremendous force, but it rested on the Sabbath. A Roman historian living earlier than Rabbi Akiva, Pliny the Elder (24–79 C.E.) described the river in his work “Natural History.” He writes that the river ran rapidly for six days in the week and rested on the Sabbath. Rabbi Akiva was not only referring to a physical river, but also to a metaphoric river. Life may times, is a journey through a tumultuous river, hurling heavy stones on us. Then comes Sabbath, and the river rests. No rocks flying at you. On Shabbat, our river becomes tranquil and serene. This is the power of the Shabbat. In a world which is changing by the week, or by the day, or by the minute, and sometimes by the second, on Shabbat, we focus on that which is eternal in our lives. Our aspirations to become better people, our love to our spouse and children, our relationship with our soul and with our G-d, our need for prayer and study, our yearning for reflection and transcendence. Shabbat, when observed properly, is truly a spiritual oasis in time and space. The Sabbath - G-ds' Day?? Some years back, Norman Mailer made a run for Mayor of New York. One of the more intriguing points of his platform was the idea that one day a week everybody should shut off their phones, TVs and radios, stay away from the malls and the movies, and just learn to meditate and to reacquaint themselves with nature, their families and their own feelings. Doing just that, is in fact, one of only ten major principles G-d inscribed on tablets of stone as the bases for human survival. Almost 4,000 years ago, G-d called the plan Shabbat—the Sabbath—and those who take this divine advice seriously have been benefiting from its’ gifts ever since. Joe Lieberman relates in his new book on Shabbat, that when he was nominated in 1988 as Connecticut Senator, Chris Dodd, long time Connecticut Senator and famous Democratic Party politician, and a Baptist, announced at the big party: Joe Lieberman is really a Baptist. However when he realized how many events he would have to attend on Saturdays, he became an Orthodox Jew! Lieberman declares that the joke is not far from the truth. Because on this day he does not answer emails, telephones, texts, unless they are of concern to National Security. He does not shop, nor engage in home repairs. He does not even go to the movies or shopping. Rather, he spends real time, quality time, substantive time, with himself, with his loved ones, with his soul, with his G-d.
“It's been a life-saver to our family and our marriage and our home life because it's given us a moment to stop and break off from the nonsense we all deal with," Hadassah Lieberman says. "We can talk to each other without the Blackberries ringing in our faces." 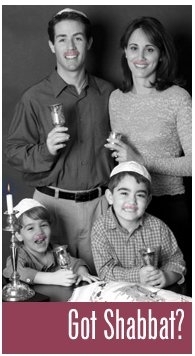 For hundreds of generations of Jews, Shabbat is the epicenter of the Jewish week. I am going to describe to you the home, of those who observe this very special day. It’s late Friday afternoon after a very hectic week. All of a sudden everything stops. As the sun sets, a new energy enters the home. The mother and the daughters kindle a glowing flame, bringing a little light into the world. Mother covers her eyes by the burning flames and pours her heart out to G-d for all the blessings of health and happiness for her and the family. The home is transformed into a palace. Father and boys go to synagogue to sing songs, pray to G-d and meet friends. When they return home, a beautiful white table cloth is spread over the table. Hot delicious Challah (bread made for the day of Sabbath), is on the table with bottles of wine and the aroma of lovely food coming from the kitchen. The father, became a king and the mother a queen; the son -- a prince and the daughter -- a princess. The father kisses his children “Shabbat Shalom, (May you be blessed with a peaceful Shabbat” and the mother embraces each of her precious diamonds with so much love. A Divine presence pervades the home on Shabbat. The father makes Kiddush (the religious service to usher in the holy day). And then calls over each of his children, places his hands on their head, and blesses them. He tells them how much he loves them, how much they mean to him, how thankful he is to have them and how he would always be there for them, unconditionally, forever. to be continued --more next week…. Once, there where three sons who wanted to honor their mother for her 90th birthday. They where all pretty wealthy and money wasn’t an issue. One decided to buy his mother a mansion, the other bought a brand new luxury car with a chauffeur. He thought, that would be perfect for his mother who was from the old country and loved the verses from the Bible. He paid the $150,000 for this astonishing bird and gave it to his mom for her birthday. Many times we have so many opportunities handed to us on a silver platter and instead of using it for its intended incredible purpose, we waste it on trivial matters. Whether it’s because we don’t know, or we don’t care we certainly don’t want to lose what’s already been granted and gifted to us. Take the lessons from the Bible for example. We would rather read a fresh new article written in some trendy magazine, which is sure to change almost 180 degrees the following month, than benefit from the time tested, successful advice handed to us by G-d.
We have here a phenomenal lesson on how one is able to reach, “enjoyment and good in life”. Some people have this idea, that the more they indulge in their own self, and do things to satisfy their desires the more they will find happiness. This, only places them deeper, and further away from the happiness they yearn for. G-d was telling Abraham and everyone who draws an eternal message from the Bible. If you want to find yourself, if you really want to experience the maximum life has to offer, it’s not by self-gratification and hedonism. You must leave your land, your world etc. The desires that come by itself and natural for most people, is usually connected to materialism and associated with the coarseness of this world. The habits and routines we have developed over the years, many of them if not most of them, support our desires. And, doing things ONLY because it makes sense to us, keeps us confined to our own self. No real growth there. When a person decides that his desires, habits and thinking must include a greater benefit for society, to elevate the consciousness in the world to higher standards of morals and values and the awareness of G-d, he will truly reach his greatest potential. A person who dedicates his life not just to himself but to the world, to make it a better place, is a happier person with a more enjoyable life, for his, own good.